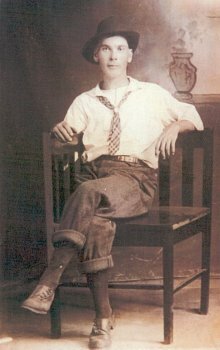 Having written and published the article Cecil Sharp in America, I received an email from Kriss Sands, a grandson of Mary Sands who had sung songs to Cecil Sharp in 1916 when Sharp was in Madison County, NC. Kriss asked me why I had not mentioned his grandmother in the article, she was, after all, an important singer who gave Sharp over twenty songs. I replied, saying that I just did not have room in the article to mention all the people that Sharp had met in America. I also added that if he could supply me with any information regarding Mary Sands then we could, perhaps, write a joint article about her. I also asked if he had any photographs of his grandmother. I did this because we have none of Sharp’s 1916 photographs. 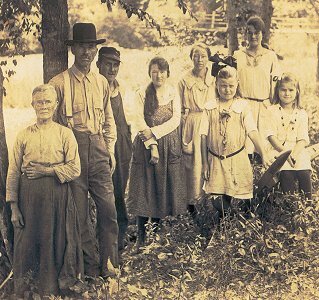 Sharp had certainly taken pictures of some of his Appalachian singers in 1916, but it seems that only photographs taken in 1917 and 1918 have survived. Kriss did have some pictures and together we wrote A Nest of Singing Birds. Kriss, who now lives in California, then contacted the News-Record and Sentinel, the local paper that covers Madison County, NC., to tell them about the article. The Sentinel ran their own article and Fred Hughes, the editor, kindly sent me a copy. 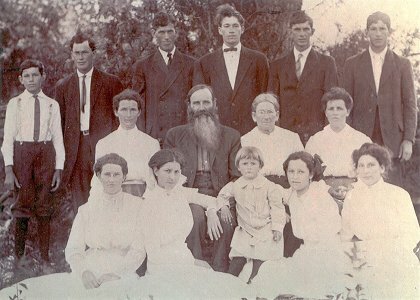 As I read their piece I began to wonder if there were any other descendants of Sharp’s Madison County singers who might also have some family photographs. I wrote to Fred, enclosing a list of Sharp’s singers, and he printed my letter. 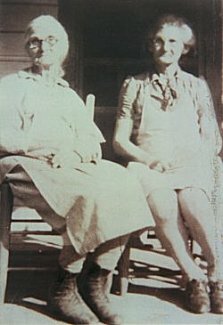 Within days I had been contacted by Lois Hensley (nee Shelton), who now lives in Tennessee, and Frances Ray, who now lives in Virginia. This wonderful pair of ladies managed to supply me with photographs of nine of Sharp’s singers. Kriss Sands had been able to find pictures of Mary Sands and her half-brother Mitchell Wallin, the fiddler and singer; John Cohen photographed Zipo Rice and Lloyd Chandler (who may have been the Floyd Chandler who sang a fine version of Young Hunting to Sharp in 1916); and Betty Smith included pictures of Jane Gentry in her book A Singer Among Singers. This means that we now have pictures of a dozen of Sharp’s thirty or so Madison County singers. A Nest of Singing Birds contains four photographs, and a further seven appear below. There must be photographs of some, if not all, of the remaining singers. I can only do so much, living as I do, so far away in England. Perhaps there are some American folklorists in North Carolina or Tennessee who could continue the search? All the photographs that I have will be passed to the Vaughan Williams Memorial Library in London for safe-keeping. In the meantime, though, here are some of the pictures, together with a few comments from Cecil Sharp (in italics) and myself. 29 July, 1916. ‘I call on Mrs Noah Shelton who sang me 2 or 3 beautiful songs, including ‘On Friday Night’ (‘The Lover’s Lament’), a lovely dorian tune....after a picnic lunch we call on Mr & Mrs Sol Shelton & family - a most delightful lot of people. Here I got 3 or 4 more songs...walked home beaming with pleasure after so successful a day’. 9 August, 1916. ‘Called on Sol Shelton’s in the afternoon and had a long talk there taking down one song from Donna’. 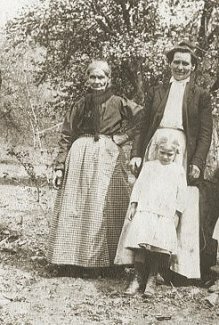 Sharp called on Mrs Noah Shelton of Alleghany during the morning of 29 July, 1916, and collected Lord Thomas and Fair Ellender and The Lover’s Lament from her. He then visited Mr Solomon (‘Sol’) Shelton and his family in the afternoon, hearing The Wife of Usher’s Well sung as a duet by Solomon and his young daughter, Virginia. There is a striking facial similarity between Noah and Solomon Shelton. Were they, perhaps, brothers? On 5 August, 1916, Sharp collected a further version of Lord Thomas and Fair Ellender from Mary Sands of Allanstand, not far from Alleghany. In 1980 I recorded two of Mrs Sands’ relatives, Doug and Cas Wallin, singing their versions of the same ballad. These latter recordings are available on the double CD Far in the Mountains - vols. 3 & 4 (Musical Traditions MTCD 323-4). 1 August, 1916. 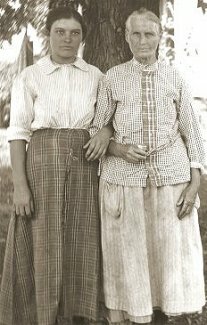 'I walked up the creek to Mrs Dora Shelton who, after some persuasion, sang "Wife of Usher's Well" - a very good tune, and one or two others'. Although Sharp's diary states that he collected the above ballad on 1 August, the version printed in English Folk Songs from the Southern Appalachians is dated from 15 August. Sharp also noted versions of Lord Randal, George Collins and Macafee's Confession from Dora Shelton on 2 August. 4 August, 1916. ‘In the afternoon went to Mrs Gosnell’s where Mrs (Mary) Sands joined us. Both she and Mrs Gosnell sang and I got some very good songs indeed. A very fruitful day on the whole’. 8 August, 1916. ‘We could not find Hensley’s house but happened on a Mrs Nancy E Shelton. She asked us in and sang a version of ‘Outlandish Knight’ very beautifully’. Matilda Gosnell gave Sharp versions of In Seaport Town and The Rich Old Lady on 4 August. When I first visited Sodom Laurel in 1979 the only store there was called ‘Gosnell’s Store’. It was, presumably, run by her descendants. When I returned in 1998 the building had become a church. Nancy Shelton was a daughter of Mrs Gosnell. 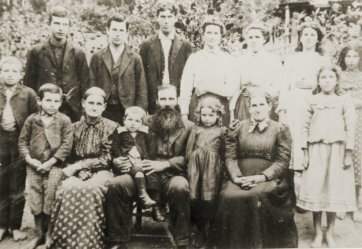 Many of Sharp’s Appalachian singers were related to each other. Occasionally Sharp would travel quite a distance to collect songs from relatives who had been mentioned by other singers. 18 August, 1916. 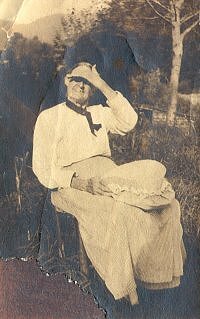 ‘Again to Mrs Tom Rice where she and Mrs Minnie Rice (her daughter-in-law) gave me several nice songs’. Sharp collected five versions of the song Old Grey Noddle, including a version, titled My Mother Bid Me, from Mrs Minnie Rice of Big Laurel, NC. Clearly, she did not follow the words of the song, as she is pictured here with her husband! A version of the song that I recorded from the Sussex singer Mabs Hall can be heard on a Veteran CD When the Wind Blows (VTC5CD). Mabs also called the song Old Grey Noddle. 6 September, 1916. ‘We started off for Spillcorn at 9 a.m. A very difficult walk over ‘Tater Gap, very steep, and very stony, but for the most part in shade - all very wild and beautiful, especially the latter part up Spillcorn Creek. Called on Harland Shelton but did not get much in the way of songs because an old ‘Holiness’(? ), Silas Shelton, was there and groused against ‘love-songs’ as the folk-ballads & songs are called in this country’. Although Silas Shelton ‘groused’ at the ‘love-songs’, he was not averse to singing the religious song Hick’s Farewell, which Sharp noted down. North Carolina singer Doc Watson sings a version of Hick’s Farewell, accompanied by his father-in-law Gaither Carlton on fiddle, on Smithsonian-Folkways album there is no eye (SFW CD 40091). Donna Shelton: Previously mentioned above, but this is a great picture. 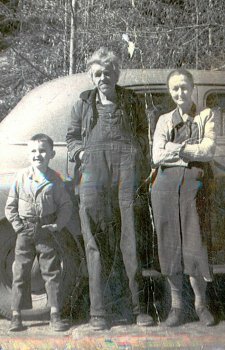 Polly Shelton: Sharp collected his first Appalachian songs on 28 July, 1916, and the second singer was Polly Shelton, 75 years old from White Rock, Madison County. 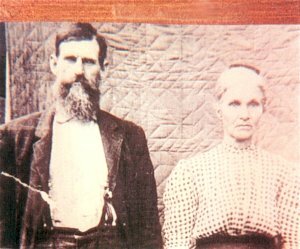 Sharp collected two songs from her, Earl Brand and General Longstreet, although he only published Earl Brand in his Appalachian book. Sharp was delighted to find a version of Earl Brand, a Child ballad that he had not previously encountered. Sol & Virginia Shelton: Previously mentioned above. The family included Stella Shelton: Sharp visited Stella Shelton on the following day and collected versions of In Seaport Town and I'm Going to Georgia from her. 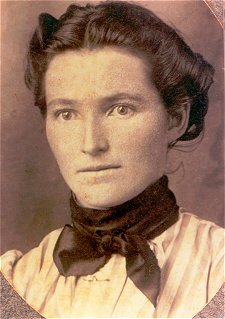 Anna Eliza Chandley (called Anelize Chandler by Sharp): Mrs Chandley, of Alleghany, Madison County, gave Sharp three songs on 28 August, 1916, The Daemon Lover (The Housecarpenter), Awake! Awake! (The Drowsy Sleeper) and The False Young Man. There were, said Sharp, 'Three good songs'.